Adults fit about 14.5-15 mm eye chips. Babies fit about 11.5-12 mm eye chips. So I got another ask in my inbox wanting to know if there were any tutorials on how to replace furby eye chips, and since I had nothing better to do today I went ahead and popped my confetti baby’s eyes out! 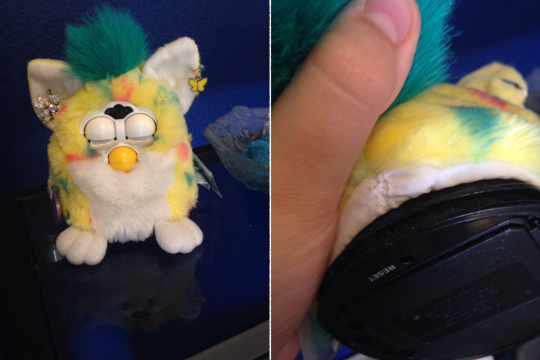 To start, you’ll need to skin your furby. Play-doh has gone through a skinning before, so I never put their zip-tie back into the groove. 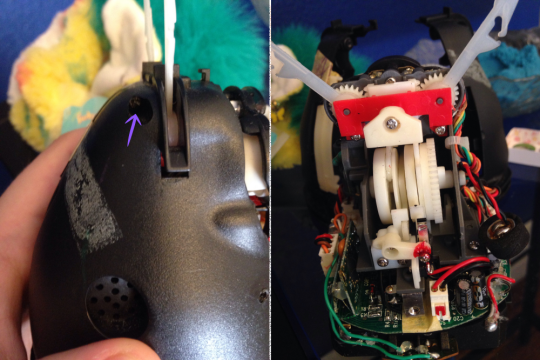 If you want to keep the zip-tie intact, you’ll need a strong grip and a flathead screwdriver to shimmy it out of the groove. Once you either shimmy it out or simply cut the tie, it’s on to the next step! 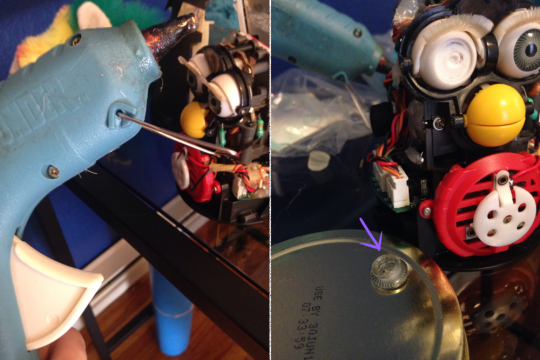 As you’re peeling the skin up the furby you can start undoing some of the screws for the outer casing. There are about two base screws. Now, what I don’t have pictured here is the additional screws i took out that held the faceplate in place. 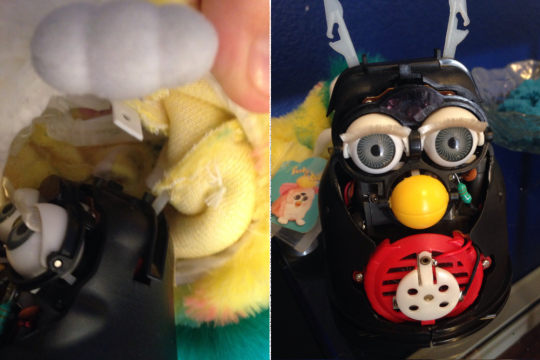 Some furby’s have their faceplate’s hot glued, or screwed. Either way, you’ll need to lift the plate off with the rest of the skin in order to continue. Next you’ll need to cut the threads holding the skin to the ear bone (that sounds gross haha) and finally peel off the skin entirely! There is one last screw holding the casing together. 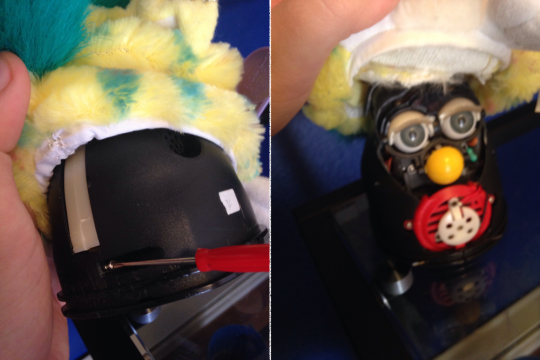 Once you take that out, the casing should be easy to take apart from the mechanics (though some furby’s mics and wires are taped/hot glued to the casing). With the casing completely off, you’ll have better reach and room to work with. The arrow is pointing to the back of the eye, since just looking at these pictures alone is confusing me haha. Now, normally I’d have used a seam ripper to poke into the small hole in the back of the eye and prod the original chip out, however, I noticed that Play-doh’s eye base doesn’t have the holes! I resorted to using the hot-glue gun method (testing it out for myself at least) and it did the job. 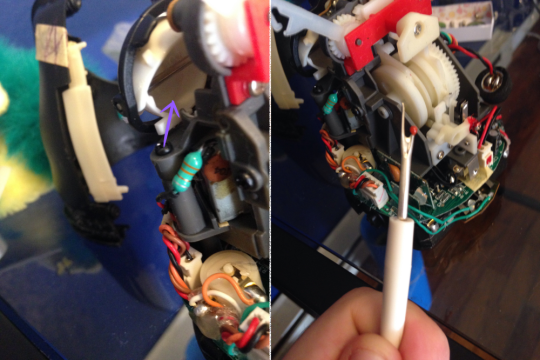 However, if you want to salvage the chips this method wont work for you because the gun will melt through the resin/plastic of the eye-chips and make them useless. Hope this helps all of you who needed a visual aid, happy customizing! Credit for the content of this page goes to Furbydude on Tumblr, and permission has been given to put it on this site.